Our Junior Camp (ages 7-9) is a specifically designed program for first time campers, to help young children become familiar with and comfortable in the natural environment. We offer both a one-week option and a two-week option. The high staff to camper ratio provides a perfect setting for storytelling, fishing, campfires, arts and crafts, environmental awareness, swimming, games, and canoeing. Our staff is sensitive and caring, and will make sure your child is well cared for during his or her stay. 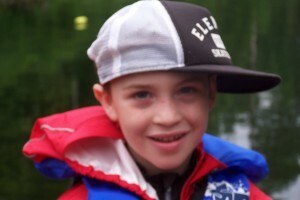 A Junior Camper about to leave on his first canoe trip. For one week Juniors, we plan a two night canoe trip where campers share the experience of sleeping in tents and cooking in the outdoors. Two-week Juniors go on 2 two-night trips. Our Junior canoe trips are custom designed for smaller paddlers. They have short paddling distances and much opportunity for swimming and playing on the campsites. While in camp, campers sleep in supervised cabins and learn the basics of canoeing and wilderness camping skills with emphasis on safety as well as fun. Schedule and pricing for the Junior Camp program.